The official announcement of the winner and presentation of the award will be made at the Equine Industry Vision Award Breakfast on Friday, June 17, 2016 during the AHP May the Horse Be with You Seminar in Orlando, Florida. The recipient will be presented with the Equine Industry Vision Award Trophy created by master artisan Peter Wayne Yenawine. 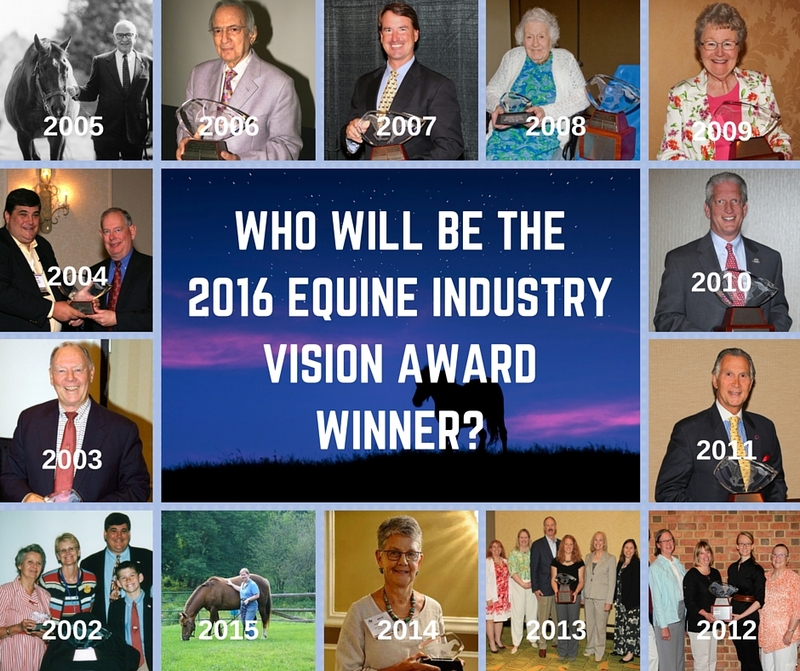 Previous recipients of the Equine Industry Vision Award are Alexander Mackay-Smith in 2002, Don Burt in 2003, the American Quarter Horse Association in 2004, John Ryan Gaines in 2005, Stanley Bergstein in 2006, David O'Connor in 2007, Sally Swift in 2008, Charlotte Brailey Kneeland in 2009, John Nicholson in 2010, Robert E. Cacchione in 2011, Equine Land Conservation Resource in 2012, Professional Association of Therapeutic Horsemanship (PATH) in 2013, Patti Colbert in 2014, and Gayle Ecker in 2015.